HOUSTON – John Charles, Ph.D., spoke about “Astronaut Health and Performance Risks during Spaceflight beyond Low Earth Orbit” at the Southwest Center for Occupational and Environmental Health (SWCOEH) 17th annual Pilot Projects Research Symposium on June 3. The Pilot Projects Research Training Program (PPRTP) is part of SWCOEH’s Education and Research Center, which provides research training opportunities and is funded by the National Institute for Occupational Safety and Health (NIOSH). Charles is chief scientist of the NASA Human Research Program at Johnson Space Center. The more than 40 attendees included UTHealth faculty, trainees, students, and staff from the School of Public Health’s Houston and San Antonio campuses. 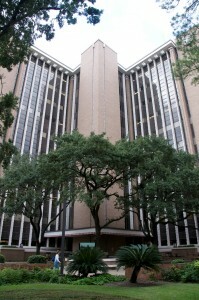 The symposium was held in Houston with ITV to San Antonio. NASA’s Human Research Program conducts studies on how space exploration affects the human body. The program is aligned with the mission of SWCOEH, which is to promote and improve health, safety, and well-being in the workplace and the community. Charles clarified that (contrary to common belief) NASA is not closed. Many attendees were interested in NASA and had been following in the media NASA’s Twins Study of identical twins and astronauts, Scott and Mark Kelly, as well as the One-Year Mission involving Scott Kelly of NASA and Mikhail Kornienko of the Russian Federal Space Agency (Roscosmos). The One-Year Mission was the longest space mission ever completed by a NASA astronaut. Charles said the NASA Human Research Program will continue to explore medical conditions, events, and risk factors to human health during spaceflight. He stressed that this was imperative for the future advancement of human health for long duration spaceflight. He also noted that plans for spaceflight to and exploration of Mars are in the future. faculty in areas other than occupational health research who wish to transition or expand their research interest to workers’ health issues (“new faculty investigators”). Through this program, more than 1.2 million dollars in awards have been extended to approximately 119 trainees and investigators. Please visit the PPRTP website at or email PilotProjects@uth.tmc.edu for more information.